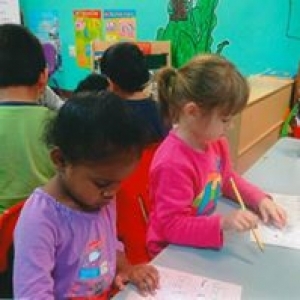 Kids Choice Academy is a premier early childhood learning center with two convenient locations in Egg Harbor Township, NJ. We accept enrollement of children from 6 weeks through third grade. Our centers offer both full-day and half-day programs to benefit the needs of your children and schedule. We are open Monday-Friday from 6:30 am to 6:00 pm and will soon be offering care for children on the weekends. Kids Choice Academy is owned and operated by an Early Childhood Education Specialist who truly understands the needs of preschool children. Our curriculum is developmentally appropriate and will stimulate and challenge your child. Our qualified teachers provide a nurturing environment in which your child will thrive. Kids Choice Academy provides excellent security measures for your child's safety. We use a Biometric Fingerprint System to allow access to our sites. We also have a state-of-the-art video surveillance system which allows you access to view your child's classroom from your home or work computer or smartphone. Kids Choice Academy offers breakfast, lunch, and snack at no additional cost. We also offer several different extra-curricular activites for your children. Please contact us to schedule a tour! We can be reached by phone at (609)272-1181 or by email at kidschoiceacademy@verizon.net. Also, view our website for more details about our program at www.kidschoiceacademy.com.